Domenica Ruta grew up in a working-class, unforgiving town north of Boston, in a trash-filled house on a dead-end road surrounded by a river and a salt marsh. Her mother, Kathi, a notorious local figure, was a drug addict and sometimes dealer whose life swung between welfare and riches, and whose highbrow taste was at odds with her hardscrabble life. And yet she managed, despite the chaos she created, to instill in her daughter a love of stories. Kathi frequently kept Domenica home from school to watch such classics as the Godfather movies and everything by Martin Scorsese and Woody Allen, telling her, “This is more important. I promise. You’ll thank me later.” And despite the fact that there was not a book to be found in her household, Domenica developed a love of reading, which helped her believe that she could transcend this life of undying grudges, self-inflicted misfortune, and the crooked moral code that Kathi and her cohorts lived by. 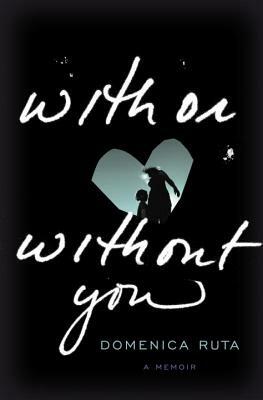 With or Without You is the story of Domenica Ruta’s unconventional coming of age—a darkly hilarious chronicle of a misfit ’90s youth and the necessary and painful act of breaking away, and of overcoming her own addictions and demons in the process. In a brilliant stylistic feat, Ruta has written a powerful, inspiring, compulsively readable, and finally redemptive story about loving and leaving. There's nothing like a memoir by a gal with a messed up childhood to make you feel better about the way you were raised. This wasn't the most horrendous upbringing I've ever read about but With or Without You made me grateful for my "normal" family. There's neither structure nor routine to life with Kathi. Domenica isn't sure from one day to the next what mood she'll find her mother in. Will she be protective and loving? Will she be out of control with anger? Besides the mental illness her mother was obviously suffering from there was also drug addiction. And hey, who wouldn't share their OxyContin pills with their young daughter? Here you go sweetie, love ya! While With or Without You was beautifully written I do have to mention a couple of problems I had with it. The last quarter of the book seemed a bit rushed and disjointed. Domenica suffered from addiction issues of her own but managed to graduate from college with exceptional grades, earning an MFA. I would have liked to hear more about how she pulled that off. Despite those few issues I would absolutely recommend this book. Read it. Sounds like a good read. You may have read The Glass Castle by Jeanette Walls, about a family in which the children are neglected? It is similar in that the children still manage to make something of their lives, and I love that, a sort-of happy ending. I did read The Glass Castle, but it's been a long while. That's one I wouldn't mind re-reading! Thanks for sharing your thoughts. I'll have to make a point of reading this one sooner rather than later. You bet Melissa :) I hope you like it! I have this on my nightstand and was just eyeing it this morning. Thanks for you review, I will pick it up soon! That book sounds soooooo messed up. . . in a way that makes it really interesting to read! And to be honest, the sharing drugs thing is probably not as uncommon as you would thing, although it's usually in reverse. Usually, the parents are taking the children's prescription pills. How did you and the other poster that has it on her nightstand get a hold of this one so soon? I have it pre-ordered. What am I missing? How do I get all these early reads, girlie? After what you've written and the summary, knowing how she managed to graduate is surely both important and interesting, so it's a shame that was rushed. Otherwise though, it sounds very good and, to repeat a word, important. I have this one in my queue! I should read it then, right?